Cardiac catheterization is a universal procedure used to diagnose and treat a broad range of heart problems in children and adults. Often, the best repair of heart problems that once required open-heart surgery can now be provided in a cardiac catheterization laboratory, also known as cath lab. The cath lab is outfitted with digital imaging equipment and computers for fluoroscopy and cineangiogram (movies of the heart) that allow for precise assessment of heart problems. A diagnostic cardiac catheterization provides information that assists cardiologists and cardiac surgeons in treating patients with heart defects. An interventional catheterization can provide a non-surgical treatment of a congenital or acquired cardiovascular disorder. Cardiac cath labs are comprised of several types of cath lab parts with imaging equipment at the foundation. 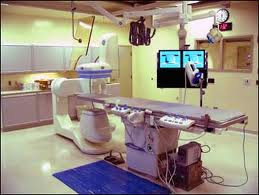 An early decision regarding this equipment and cath lab parts is necessary to allow the medical facility planners to best make use the system’s specifics in the procedure room layout. The facility should select cath lab equipment based on population needs (current and long term) and physician/staff preferences, while still keeping in mind the hospital’s budget. Cardiac imaging systems typically have a smaller image intensifier cath lab part size to provide a more concentrated area of focus. If the procedure room will also be used for peripheral studies, consider a dual intensifier size system that will allow for larger areas of focus. If peripheral work is to be done in this setting, the C-arm cath lab part should allow for full table panning to include the legs. Flat panel cath lab part technology is now available and becoming more common. Conventional digital imaging uses a fluoroscopic imaging chain including an analog image intensifier, while flat panel imaging converts the x-ray signals into digital images. Flat panel cath lab part technology reduces the radiation dose required for imaging. Rotational angiography, which allows for 3-D imaging of the arteries, is another cath lab part equipment option offered by most of the major manufacturers. Make sure that the table, another important cath lab part, has a weight capacity as high as possible. Most vendors can offer a table with a capacity of up to 450 pounds. To allow for stretcher positioning, the table should also be able to rotate sideways a minimum of ninety degrees. Cath lab part tables may be floor or ceiling-mounted and are generally selected as to what is available from a particular manufacturers and what is required by the room’s physical limitations.